This large, nearly commercial-grade machine, thirty pounds heavy and capable of making nearly a ten-inch slice through cooked meats, has many of the features of restaurant quality machines and is just as hard to clean. 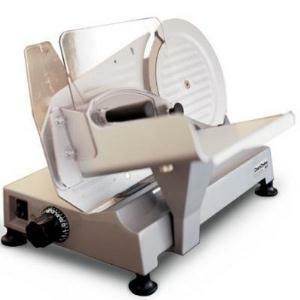 With a machine this big you get the efficient and precise slicing you want when you invest in an electric food slicer. A few compromises have been made on this design, but not too many to forgive. Some fittings and adjustment screws are plastic, and breaking down the machine for cleaning requires an allen wrench and a screwdriver -- but if you really need a slicer you can depend upon for regular work, this will do fine. The motor is fairly quiet and packs 180 watts of power, enough to handle most meats although high friction jobs like cheese will have to be broken down into workable blocks. A blade sharpener is built into the machine, and a safety device for handling the ten-inch circular blade during cleaning is a real relief to see. (If you've never nearly dropped one, the only thing scarier is the impulse to try and catch it.) The engineers were very safety conscious, including several welcome finger saving features that don't inhibit operation. The carriage, often a source of binding and other problems in cheaper machines, is mounted on ball bearings for smooth operation every time. The disappointment comes when it's time to clean the machine -- even though the breakdown is fairly simple, there are several awkward pieces involved, and gaps into which juices will surely creep. Elbow grease is the only real solution. Also see the Waring Pro Electric Slicer to compare.